James was the son of King James IV of Scotland and his wife Margaret Tudor, a daughter of Henry VII of England and sister of Henry VIII, and was the only legitimate child of James IV to survive infancy. He was born on 10 April 1512 at Linlithgow Palace, Linlithgowshire and baptized the following day, receiving the titles Duke of Rothesay and Prince and Great Steward of Scotland. He became king at just seventeen months old when his father was killed at the Battle of Flodden Field on 9 September 1513. Accordis nocht to thy majestie. In the autumn of 1524 James dismissed his regents and was proclaimed an adult ruler by his mother. Several new court servants were appointed including a trumpeter, Henry Rudeman. Thomas Magnus, the English diplomat, gave an impression of the new Scottish court at Holyroodhouse on All Saints' Day 1524: "trumpets and shamulles did sounde and blewe up mooste pleasauntely." Magnus saw the young king singing, playing with a spear at Leith, and with his horses, and he was given the impression that the king preferred English manners over French fashions. In 1525 Archibald Douglas, 6th Earl of Angus, the young king's stepfather, took custody of James and held him as a virtual prisoner for three years, exercising power on his behalf. There were several attempts made to free the young King – one by Walter Scott of Branxholme and Buccleuch, who ambushed the King's forces on 25 July 1526 at the battle of Melrose, and was routed off the field. Another attempt later that year, on 4 September at the battle of Linlithgow Bridge, failed again to relieve the King from the clutches of Angus. When James and his mother came to Edinburgh on 20 November 1526, she stayed in the chambers at Holyroodhouse, which Albany had used, James using the rooms above. In February 1527 Henry Fitzroy, Duke of Richmond, gave James twenty hunting hounds and a huntsman. Magnus thought the Scottish servant sent to Sheriff Hutton Castle for the dogs was intended to note the form and fashion of the Duke's household, for emulation in Scotland. James finally escaped from Angus's care in 1528 and assumed the reins of government himself. The first action James took as king was to remove Angus from the scene. The Douglas family – excluding James's sister, Margaret, who was already safely in England – were forced into exile and James besieged their castle at Tantallon. He then subdued the Border rebels and the chiefs of the Western Isles. As well as taking advice from his nobility and using the services of the Duke of Albany in France and at Rome, James had a team of professional lawyers and diplomats, including Adam Otterburn and Thomas Erskine of Haltoun. Even his pursemaster and yeoman of the wardrobe, John Tennent of Listonschiels, was sent on an errand to England, though he got a frosty reception. James increased his income by tightening control over royal estates and from the profits of justice, customs and feudal rights. He also gave his illegitimate sons lucrative benefices, diverting substantial church wealth into his coffers. James spent a large amount of his wealth on building work at Stirling Castle, Falkland Palace, Linlithgow Palace and Holyrood, and he built up a collection of tapestries from those inherited from his father. James sailed to France for his first marriage and strengthened the royal fleet. In 1540 he sailed to Kirkwall in Orkney, then Lewis, in his ship the Salamander, first making a will in Leith, knowing this to be "uncertane aventuris." The purpose of this voyage was to show the royal presence and hold regional courts, called "justice ayres." James recovered money from the church by getting Pope Clement VII to allow him to tax monastic incomes. He sent £50 to Johann Cochlaeus, a German opponent of Martin Luther, after receiving one of his books in 1534. On 19 January 1537 Pope Paul III sent James a blessed sword and hat symbolising his prayers that James would be strengthened against heresies from across the border. These gifts were delivered by the Pope's messenger while James was at Compiègne in France on 25 February 1537. According to 16th-century writers his treasurer James Kirkcaldy of Grange tried to persuade James against the persecution of Protestants and to meet Henry VIII at York. Although Henry VIII sent his tapestries to York in September 1541 ahead of a meeting, James did not come. The lack of commitment to this meeting was regarded by English observers as a sign that Scotland was firmly allied to France and Catholicism, particularly by the influence of Cardinal Beaton, Keeper of the Privy Seal, and as a cause for war. In a July 1541 communication with Irish chiefs, James assumed the style of "Lord of Ireland" (dominus Hiberniae), as a further challenge to Henry VIII, lately created King of Ireland. As early as August 1517 a clause of the Treaty of Rouen provided that if the Auld Alliance between France and Scotland was maintained, James should have a French royal bride. Yet the daughters of Francis I of France were promised elsewhere or sickly. Perhaps to remind Francis of his obligations James's envoys began negotiations for his marriage elsewhere from the summer of 1529, both to Catherine de' Medici, the Duchess of Urbino, and Mary of Austria, Queen of Hungary, the sister of Holy Roman Emperor Charles V. But plans changed. In February 1533, two French ambassadors, Guillaume du Bellay, sieur de Langes, and Etienne de Laigue, sieur de Beauvais, who had just been in Scotland, told the Venetian ambassador in London that James was thinking of marrying Christina of Denmark. Marguerite d'Angoulême, sister of Francis I, suggested her sister-in-law Isabella, who was the same age. Francis I insisted that his daughter Madeleine's health was too poor for marriage. 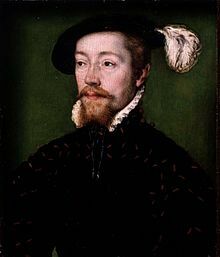 Eventually, on 6 March 1536, a contract was made for James V to marry Mary of Bourbon, daughter of the Duke of Vendôme. She would have a dowry as if she were a French Princess. James decided to visit France in person. He sailed from Kirkcaldy on 1 September 1536, with the Earl of Argyll, the Earl of Rothes, Lord Fleming, David Beaton, the Prior of Pittenweem, the Laird of Drumlanrig and 500 others, using the Mary Willoughby as his flagship. First he visited Mary of Bourbon at St. Quentin in Picardy, but then went south to meet King Francis I. During his stay in France, in October 1536, James went boar-hunting at Loches with Francis, his son the Dauphin, the King of Navarre and Ippolito II d'Este. James renewed the Auld Alliance and fulfilled the 1517 Treaty of Rouen on 1 January 1537 by marrying Madeleine of Valois, the king's daughter, in Notre Dame de Paris. The wedding was a great event: Francis I made a contract with six painters for the splendid decorations, and there were days of jousting at the Château du Louvre. At his entry to Paris, James wore a coat described as "sad cramasy velvet slashed all over with gold cut out on plain cloth of gold fringed with gold and all cut out, knit with horns and lined with red taffeta." James V so liked red clothing that, during the wedding festivities, he upset the city dignitaries who had sole right to wear that colour in processions. They noted he could not speak a word of French. James and Madeleine returned from France on 19 May 1537, arriving at Leith, the king's Scottish fleet accompanied with ten great French ships. As the couple sailed northwards, some Englishmen had come aboard off Bridlington and Scarborough. While the fleet was off Bamburgh on 15 May, three English fishing boats supplied fish, and the King's butcher landed in Northumbria to buy meat. The English border authorities were dismayed by this activity. Madeleine did not enjoy good health. In fact she was consumptive and died soon after arrival in Scotland in July 1537. Spies told Thomas Clifford, the Captain of Berwick, that James omitted "all manner of pastime and pleasure", but continually oversaw the maintenance of his guns, going twice a week secretly to Dunbar Castle with six companions. James then proceeded to marry Mary of Guise, daughter of Claude, Duke of Guise, and widow of Louis II d'Orléans, Duke of Longueville, by proxy on 12 June 1538. Mary already had two sons from her first marriage, and the union produced two sons. However, both died in April 1541, just eight days after baby Robert was baptised. Their daughter and James's only surviving legitimate child, Mary, was born in 1542 at Linlithgow Palace. According to legend James was nicknamed "King of the Commons" as he would sometimes travel around Scotland disguised as a common man, describing himself as the "Gudeman of Ballengeich" ('Gudeman' means 'landlord' or 'farmer', and 'Ballengeich' was the nickname of a road next to Stirling Castle – meaning 'windy pass' in Gaelic). James was also a keen lute player. In 1562 Sir Thomas Wood reported that James had "a singular good ear and could sing that he had never seen before" (sight-read), but his voice was "rawky" and "harske." At court, James maintained a band of Italian musicians who adopted the name Drummond. These were joined for the winter of 1529/30 by a musician and diplomat sent by the Duke of Milan, Thomas de Averencia de Brescia, probably a lutenist. The historian Andrea Thomas makes a useful distinction between the loud music provided at ceremonies and processionals and instruments employed for more private occasions or worship; the music fyne described by Helena Mennie Shire. This quieter music included a consort of viols played by four Frenchmen led by Jacques Columbell. It seems certain that David Peebles wrote music for James V and probable that the Scottish composer Robert Carver was in royal employ, though evidence is lacking. Si que Venus et Mars en avoient fait partage"
as if he were the child of Venus and Mars. James was a poet himself; his works include "The Gaberlunzieman" and "The Jolly Beggar"
he plenished the country with all kind of craftsmen out of other countries, as French-men, Spaniards, Dutch men, and Englishmen, which were all cunning craftsmen, every man for his own hand. Some were gunners, wrights, carvers, painters, masons, smiths, harness-makers (armourers), tapesters, broudsters, taylors, cunning chirugeons, apothecaries, with all other kind of craftsmen to apparel his palaces. One technological initiative was a special mill for polishing armour at Holyroodhouse next to his mint. The mill had a pole drive 32 feet long powered by horses. Mary of Guise's mother Antoinette of Bourbon sent him an armourer. The armourer made steel plates for his jousting saddles in October 1538, and delivered a skirt of plate armour in February 1540. In the same year, for his wife's coronation, the treasurer's accounts record that James personally devised fireworks made by his master gunners. When James took steps to suppress the circulation of slanderous ballads and rhymes against Henry VIII, Henry sent Fulke ap Powell, Lancaster Herald, to give thanks and to make arrangements for the present of a lion for James's menagerie of exotic pets. The death of James's mother in 1541 removed any incentive for peace with England, and war broke out. Initially the Scots won a victory at the Battle of Haddon Rig in August 1542. The Imperial ambassador in London, Eustace Chapuys, wrote on 2 October that the Scottish ambassadors ruled out a conciliatory meeting between James and Henry VIII in England until the pregnant Mary of Guise delivered her child. Henry would not accept this condition and mobilised his army against Scotland. James was with his army at Lauder on 31 October 1542. Although he hoped to invade England, his nobles were reluctant. He returned to Edinburgh, on the way writing a letter in French to his wife from Falahill mentioning he had three days of illness. The next month his army suffered a serious defeat at the Battle of Solway Moss. He took ill shortly after this, on 6 December; by some accounts this was a nervous collapse caused by the defeat, and he may have died from the grief, although some historians consider that it may just have been an ordinary fever. John Knox later described his final movements in Fife. Whatever the cause of his illness, James was on his deathbed at Falkland Palace when his only surviving legitimate child, a girl, was born. Sir George Douglas of Pittendreich brought the news of the king's death to Berwick. He said James died at midnight on Thursday 15 December; the king was talking but delirious and spoke no "wise words." According to George Douglas in his delirium James lamented the capture of his banner and Oliver Sinclair at Solway Moss more than his other losses. An English chronicler suggested another cause of the king's grief was his discomfort on hearing of the murder of the English Somerset Herald, Thomas Trahern, at Dunbar. James died at Falkland Palace but was buried at Holyrood Abbey in Edinburgh with his first wife Queen Madeleine. Before he died he is reported to have said "it came wi a lass, it'll gang wi a lass" (meaning "It began with a girl and it will end with a girl"). This was either a reference to the Stewart dynasty's accession to the throne through Marjorie Bruce, daughter of Robert the Bruce or to the medieval origin myth of the Scots nation, recorded in the Scotichronicon in which the Scots people are descended from the Princess Scota. James was succeeded by his infant daughter Mary. He was buried at Holyrood Abbey alongside his first wife Madeleine and his two sons in January 1543. David Lindsay supervised the construction of his tomb. One of his French artists, Andrew Mansioun, carved a lion and an inscription in Roman letters measuring eighteen feet. The tomb was destroyed in the sixteenth century, according to William Drummond of Hawthornden as early as 1544, by the English during the burning of Edinburgh. Scotland was ruled by Regent Arran and was soon drawn into the war of the Rough Wooing. James, Duke of Rothesay (22 May 1540, St Andrews, Fife – 21 April 1541). Arthur or Robert, Duke of Albany (12 April 1541, Falkland Palace – 20 April 1541), buried in Holyrood Palace, Edinburgh. Mary, Queen of Scots (8 December 1542, Linlithgow Palace – 8 February 1587; had issue). Many of the sons of his aristocratic mistresses entered ecclesiastical careers. Pope Clement VII sent a dispensation to James V dated 30 August 1534, allowing four of the children to take holy orders when they came of age. The document stated that James elder was in his fifth year, James younger and John in their third year, and Robert in his first year. Prior of Charterhouse, Perth. Buried at St. Magnus, Kirkwall, Orkney; tombstone survives. Jean Stewart (d. 7 January 1588), daughter of Elizabeth Bethune. Married Archibald Campbell, 5th Earl of Argyll in 1553, divorced in 1573 due to desertion. James Stewart (c. 1529–57), son of Elizabeth Shaw. Commendator of Kelso and Melrose. Prior and Commendator of Holyrood Abbey. John Stewart, Lord Darnley and Prior of Coldingham, (c. 1531 – November 1563), son of Elizabeth Carmichael (1514–1550) who later married John Somerville of Cambusnethan. He married Jean (or Jane) Hepburn, sister and heiress of James Hepburn, 4th Earl of Bothwell, their son Francis Stewart became Earl of Bothwell and a daughter Christine Stewart was appointed to rock the cradle of Prince James in March 1567. James Stewart, 1st Earl of Moray, son of Margaret Erskine, James's favourite mistress. Prior of St Andrews, Advisor and rival to his half-sister, Mary, Queen of Scots and regent for his nephew, James VI. Robert Stewart, junior, (d. 1581), mother unknown. Scott, Sir Walter, The Lady of the Lake, a Romantic narrative poem published in 1810 set in the Trossachs. He appears in disguise. The poem was tremendously influential in the nineteenth century, and inspired the Highland Revival. James also features in Scott's Tales of a Grandfather. "Johnnie Armstrong", a traditional ballad relating the story of Scottish raider and folk-hero Johnnie Armstrong of Gilnockie, who was captured and hanged by King James V in 1530. Gioachino Rossini, La Donna del Lago, an opera based on Scott's poem. Sung in Italian, James V appears as "Giacomo V". Gibbon, Charles (1881), The Braes of Yarrow . The novels features Scotland in the aftermath of the Battle of Flodden, covering events to 1514. Margaret Tudor, "Boy-King" James V, and Archibald Douglas, 5th Earl of Angus are prominently featured. Barr, Robert (1902), A Prince of Good Fellows . James is the titular Prince and the main character. He is depicted as an "adventure-loving persona". Gunn, John, The Fight at Summerdale . The novel depicts Orkney, Edinburgh and Normandy in the 16th century. James V "appears more than once" in the various chapters. Knipe, John (1921), The Hour Before the Dawn . Depicts events "just before" and "after" the death of James V. James V, Mary of Guise and David Beaton are prominently depicted. ^ Mackay, Æneas (1892). "James V of Scots" . In Lee, Sidney (ed.). Dictionary of National Biography. 29. London: Smith, Elder & Co. pp. 153–161. ^ Accounts of the Lord High Treasurer of Scotland, vol. 5, 130, extra locks bought. ^ Historic Manuscripts Commission, Earl of Mar & Kellie at Alloa House, (1904), 11–2, Ordinance for keeping James V, 3 August 1522. ^ Hadley Williams, Janet, in Mapstone, Sally ed., William Dunbar, The Nobill Poet, Tuckwell (2001), p.95: Craigie, WA ed., Maitland Folio Manuscript, Scottish Text Society, (1919), 247. ^ State Papers Henry VIII, vol. 4 part 4 (1836), 209, Magnus & Radclyff to Wolsey, 2 Nov. 1524: cf. Letters & Papers Henry VIII, vol.4 (1875) no.830: 15 Nov. 1524: Ellis, Henry, ed., Original Letters Illustrative of English History, 1st Series, vol. 1 (1825), 251–252. ^ State Papers Henry VIII, vol. 4 part 4 (1836), 460, Christopher Dacre to Lord Dacre. ^ Thomas, Andrea, Princelie Majestie, John Donald (2005), 12–15, 36: Murray, Atholl, 'Pursemaster's Accounts', Miscellany of the Scottish History Society, vol. 10, (1965), 13–51. ^ Historic Manuscripts Commission, Earl of Mar & Kellie at Alloa House, (1904), 15, Will 12 June 1540: Cameron, Jamie, James V, Tuckwell (1998), 245–248. ^ Clifford, Arthur ed., Sadler State Papers, vol. 1 (1809), 30. ^ Amongst references to the royal sheep, after James's death 600 were given to James Douglass of Drumlanrig), HMC 15th report and appendix, part viii, Duke of Buccleuch, (1897), 17, 6 January 1543. ^ Cameron, Jamie, James V, Tuckwell (1998), 260. ^ Accounts of the Lord High Treasurer of Scotland, vol.6 (1905), p.236. ^ Hay, Denys, ed., Letters of James V, HMSO (1954), 328:Reid, John J., 'The Scottish Regalia', PSAS, 9 December (1889), 28: this sword is lost. ^ Accounts of the Lord High Treasurer of Scotland, vol. 7 (1907), 18. ^ Steuart, A. Francis, ed., Memoirs of Sir James Melville of Halhill, Routledge (1929), 14–17. ^ Thomas D'Arcy McGee (1862), A Popular History of Ireland: from the Earliest Period to the Emancipation of the Catholics, Book VII, Chapter III. ^ Hay, Denys, Letters of James V, HMSO (1954), 51–52. ^ Calendar of State Papers Venice, vol. 4 (1871), no.861. ^ State Papers Henry VIII, vol.5 part 4 cont. (1836), pp.59–60. ^ Cameron, Jamie, James V, Tuckwell (1998), 131. ^ Hollingsworth, Mary, The Cardinal's Hat, Profile Books, (2004), 117. ^ Leproux, Guy-Michel, La peinture à Paris sous le règne de François Ier, Sorbonne (2001), 26. ^ Robertson, Joseph, Inventaires de la Royne d'Ecosse, Bannatyne Club, (1863), xii–xiii, note citing Thomson, Collection of Royal Inventories, (1815), 80–1. ^ Teulet, Piéces et documents inédits relatifs a l'histoire d'Ècosse, Bannatyne Club (1852), 122–5. ^ State Papers Henry VIII, vol. 5 part 4 cont., (1836), 79, Clifford to Henry VIII. ^ Accounts of the Lord High Treasurer, vol. 7 (1907), 24. ^ Letters & Papers Henry VIII, vol. 12 part 1 (1890), nos. 1237–8, 1256, 1286, 1307. ^ State Papers Henry VIII, vol.5 part IV cont., (1836) pp.94–95, Clifford to Henry VIII, 26 July 1537. ^ Black, Picturesque Tourist of Scotland, pp. 180–1 . ^ "The Court of Mary, Queen of Scots". BBC Radio 3. 28 February 2010. ^ Hay, Denys, ed., Letters of James V, HMSO (1954), 163, 169, 170: Shire, Helena M., in Stewart Style, Tuckwell (1996), 129–133. ^ Thomas, Andrea, Princelie Majestie, John Donald (1998), 105–7. ^ Drummond of Hawthorden, William, Works, Edinburgh (1711), 115. ^ George, Eyre-Todd (1892). Scottish Poetry of the Sixteenth Century. Glasgow: W. Hodge and Co. pp. 139...182. ^ Ferrerio, Giovanni, De vera cometae significatione contra astrologorum omnium vanitatem. Libellus, nuper natus et aeditus, Paris , Vascovan, (1538). ^ Thomas, Andrea, Princelie Majestie, the court of James V, John Donald, (2005), 226–243. ^ Lindsay of Pitscottie, Robert, The History of Scotland, Edinburgh, (1778), 238: abbreviated in Lindsay of Pitscottie, vol. 2, (1814), 359. ^ Accounts of the Masters of Work, vol. 1, HMSO (1957), 101–102, 242 290: Thomas Andrea, Princelie Majestie, John Donald (2005), 173. ^ Accounts of the Lord High Treasurer of Scotland, vol. 7 (1907), 95, 287 (taslet), 357 fireworks: Balcarres Papers, vol. 1, SHS (1923), 18, 20. ^ Letters & Papers Henry VIII, vol. 14 part 1, (1894), xix, no. 406: vol. 14 part 2, (1895), no. 781. ^ Calendar State Papers Spanish, 1542–1543, vol.6 part 2, London (1895), p.144, no.66. ^ Strickland, Agnes, Lives of the queens of Scotland and English princesses, vol. 1, Blackwood (1850), 402 part translated only; now preserved as National Archives of Scotland SP13/27. ^ Knox, John, "from History of the Reformation, book 2,". Archived from the original on 29 August 2009. ^ Bain, JS., ed., The Hamilton Papers, vol. 1, Edinburgh, (1890) 336–339. ^ Grafton's Chronicle, vol. ii, London (1809), 488. ^ The Scots Peerage, vol. I, p. 155. ^ Thomas, Andrea, 'Women at the Court of James V' in Ewan & Meikle ed., Women in Scotland, c.1100-c.1750, Tuckwell (1999), 86 citing the chronicles of George Buchanan, Robert Lindsay of Pitscottie, and David Lindsay's Complaynt of Scotland. ^ Williams, Janet Hadley ed., Sir David Lyndsay, Selected Poems, Glasgow (2000), 98–100, 257–9. ^ Dictionary of National Biography. Retrieved 7 August 2016. ^ Clouston, J Storer (1919). "Some further early Orkney armorials" (PDF). PSAS. UK: AHDS. p. 186. .
^ Lee, Sidney, ed. (1898). "Stewart, John (1531-1563)". Dictionary of National Biography. 54. London: Smith, Elder & Co. : James Somerville, Memorie of the Somervilles, vol.1 (1815), pp.385–9, has 'Katherine' Carmichael. ^ Register of the Privy Seal, vol. 8 (1982), 485, no. 2742. This article incorporates text from a publication now in the public domain: Wood, James, ed. (1907). "James V" . The Nuttall Encyclopædia. London and New York: Frederick Warne. Mary of Guise, also called Mary of Lorraine, ruled Scotland as regent from 1554 until her death. A noblewoman from the Lotharingian House of Guise, which played a prominent role in 16th-century French politics, Mary became queen consort upon her marriage to King James V of Scotland in 1538. Her infant daughter, Mary, ascended the throne when James died in 1542. Mary of Guise's main goal as regent was a close alliance between the powerful French Catholic nation and smaller Scotland, which she wanted to be Catholic and independent of England. She failed, and at her death the Protestants took control of Scotland, with her own grandson achieving the Union of the Crowns a few decades later. The Battle of Solway Moss took place on Solway Moss near the River Esk on the English side of the Anglo-Scottish border in November 1542 between English and Scottish forces. Magdalene of Valois or Madeleine of Valois was a French princess who became Queen of Scotland as the first spouse of King James V. The marriage was arranged as a condition of the Treaty of Rouen, and James was originally to be betrothed to another bride, but he preferred Madeleine. They married, but her health, poor since birth, failed and she died six months after the wedding, giving her the moniker the "Summer Queen" of Scots. James Hamilton, Duke of Châtellerault, 2nd Earl of Arran was a regent for Mary, Queen of Scots. James Hamilton, 3rd Earl of Arran was a Scottish nobleman and soldier who opposed the French-dominated regency during the Scottish Reformation. He was the eldest son of James Hamilton, 2nd Earl of Arran, sometime regent of Scotland. He was of royal descent, and at times was third or fourth in succession to the Scottish crown; several royal marriages were proposed for him. He went to France with Mary, Queen of Scots, and commanded the Scots Guards. After returning to Scotland, he became a leader of the Protestant party against Mary and her French supporters, but went insane in 1562 and was confined in seclusion for the rest of his life. Adam Otterburn of Auldhame and Reidhall was a Scottish lawyer and diplomat. He was king's advocate to James V of Scotland and secretary to Mary of Guise and Regent Arran. Mary of Bourbon or Marie de Bourbon was a daughter of Charles, Duke of Vendôme and Françoise d'Alençon, daughter of René, Duke of Alençon. Mary was the subject of marriage negotiations of James V of Scotland. He visited her in France, but subsequently married Madeleine of Valois. Mary died two years later.